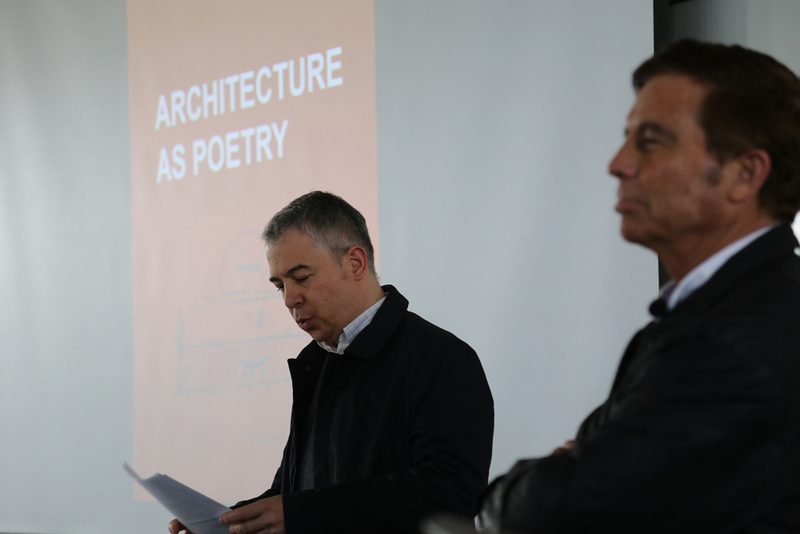 2018.10.05_Lecture “Light and Architecture: An Introduction," as invited by Prof. Nicholas Rajkovich, Ph.D. for ARC541 Environmental Systems, at the School of Architecture and Planning at the University at Buffalo. Buffalo, NY. 2017.10.19_Lecture "Espacios Imantados. Geografías del Imaginario Colectivo y Manifestaciones Culturales en el Turismo de lo Cotidiano" ("Magnetized Spaces. Geographies of the Collective Imagery, and Cultural Manifestations in Everyday Tourism"), with Prof. Mara Sánchez Llorens, at the Architecture and Society Research Forum at the School of Architecture at Anáhuac University. Mexico City. 2014.10.01_Lecture "Gazing Lights. The Filter as an Architectural Limit." Public Lecture Series. School of Architecture and Planning, University at Buffalo. Buffalo, NY. 2014.04.28_Lecture "The Failed Utopia of a Modern African Vernacular: Hassan Fathy in New Gourna," at the III International Ceramics and Architecture Congress. School of Architecture of Madrid - ETSAM. Polytechnic University of Madrid - UPM. Madrid, Spain. 2014.03.07_Lecture "Three Arms. One Mind," at the School of Design and Construction, at Washington State University. Pullman, WA. 2013.03.07_Lecture "Three Arms. One Mind," at the School of Architecture and Planning, University at Buffalo. Buffalo, NY. 2012.01.17_Lecture "Entrevisiones Construidas," ("Constructed Inter-visions"), at the School of Design and Innovation - ESNE, at the Camilo José Cela University. Madrid, Spain. 2009.05.21_Lecture "Recent Work," at the Habitat XXI: Vivienda y Ciudad Contemporáneas (Habitat 21: Contemporary Housing and City), at the Contemporary Architecture Foundation. Seville, Spain. 2018.04.28_Lecture "Espacios Imantados y Manifestaciones Culturales en el Turismo de lo Cotidiano") ("Magnetized Spaces and Cultural Manifestations in Everyday Tourism"), with Prof. Mara Sánchez Llorens, at the 2nd International Conference on Landscape, Heritage and City Contemporary Approaches to Urban Landscape. School of Architecture. University of Alcalá de Henares. 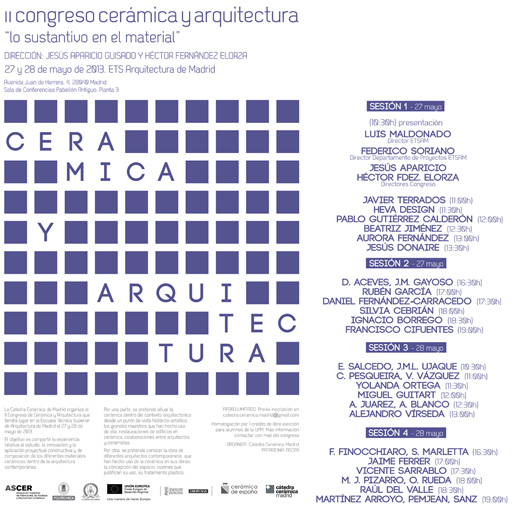 2014.11.19_Lecture "Past and Future: Spanish Ceramic Tradition," at the Advanced Architectural Ceramics Colloquium, at the School of Architecture and Planning, University at Buffalo. Buffalo, NY. 2014.05.28_Doctoral Dissertation "Filtros de Mirada y Luz. Una Construcción Visual del Límite Arquitectónico," ("Filters of Light and Gaze. 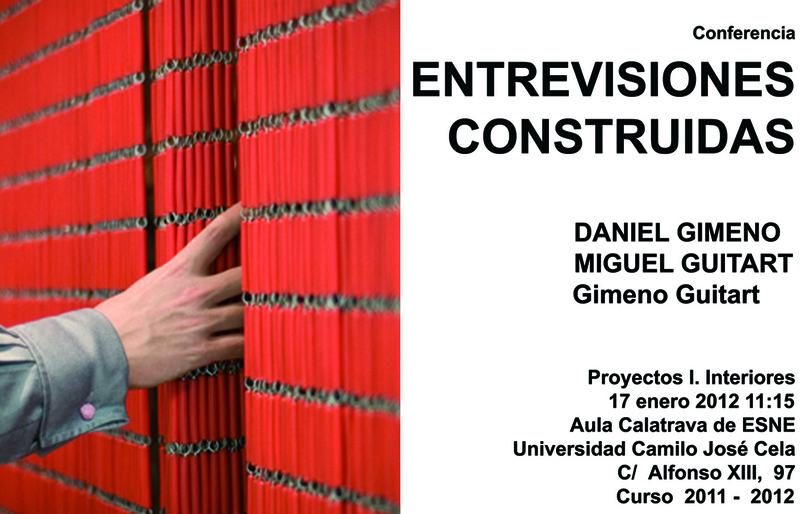 A Visual Construction of the Architectural Limit"), at the School of Architecture of Madrid - ETSAM, Polytechnic University of Madrid - UPM. 2013.05.28_Lecture "Densidad Material en la Construcción de Filtros Cerámicos. De Mélnikov a Breuer," ("Material Density in Ceramic Filters. From Melnikov to Breuer"), at the II International Ceramics and Architecture Congress. School of Architecture of Madrid - ETSAM. Polytechnic University of Madrid - UPM. Madrid, Spain. 2012.03.21_Lecture "98 Viviendas de Residencia Transitoria en Parla, Madrid," ("98 Dwellings for Transitory Occupation in Parla, Madrid"). School of Design and Innovation - ESNE, at the Camilo José Cela University. Madrid, Spain. 2012.04.28_Lecture "Estrategias de Producción de los Filtros Cerámicos," ("Production Strategies of Ceramic Filters," at the I International Ceramics and Architecture Congress. School of Architecture of Madrid - ETSAM. Polytechnic University of Madrid - UPM. Madrid, Spain. 2018.11.19_Lecture “Architecture Competitions," as invited by Prof. Annette LeCuyer for ARC402 Housing Design Studio Competition, at the School of Architecture and Planning at the University at Buffalo. Buffalo, NY. 2015.11.17_Miguel Guitart presents "The Beginning of Memory," at Pecha Kucha 2015, in Buffalo, NY. 2015.11.18_Presentation of the books The Depth of the Skin, and Architectural Practice II, at "Books/a+p: Recent Faculty Works," at the Architecture Library, University at Buffalo. Buffalo, NY. 2013.10.04_Lecture "Arquitecturas Naturalizadas y Naturalezas Arquitectonizadas. Efecto y Mímesis," ("Naturalized Architectures and Architecturalized Natures. Effect and Mimesis"), at the I International Conference on Material Strategies / Plant Architecture. School of Architecture, Francisco de Vitoria University. Madrid, Spain. 2012.05.11_Lecture "En el Interior del Espacio," ("Inside the Space"), at the School of Design and Innovation - ESNE, at the Camilo José Cela University. Madrid, Spain. 2009.12.16_Lecture "Filtros de Mirada y Luz. Entendimiento y Percepción del Espacio Construido con Cerámica," ("Filters of Light and Gaze. Understanding and Perception of the Space Configured with Ceramic"). School of Architecture of Madrid - ETSAM. Polytechnic University of Madrid - UPM. Madrid, Spain.